With grief still fresh in my heart after losing my mom in October, there are moments when Christmas feels anything but merry. During times like these, I usually turn toward Jesus and find comfort in Who He is, what He’s done, and what He promises. But this year, as I pray for those grieving around me and process the roller coaster of emotions that accompany my own grief, I noticed the other people involved in the events surrounding Jesus’ birth in Luke 2:1-20. When God came in the flesh, people were going through life unaware of their desperate need for a Savior. Business had to be handled. Rules had to be followed (1-3). Joseph was a righteous man. He didn’t hesitate to do the right thing, even though travel with his new wife was sure to be difficult. Though his circumstances were overwhelming and uncomfortable, he chose to be obedient to God (4). Mary surrendered to the Lord (5). The details surrounding her pregnancy and marriage weighed heavy on this young girl’s heart. Her suffering drew her closer to God, made her more dependent on God, ignited her passion to praise God. 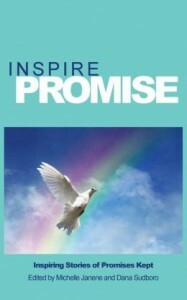 On the other side of the spectrum, the innkeeper didn’t even make room for the Lord (6-7). Would it have been too hard to let compassion clear space in his heart for a family who looked like they had nothing good to offer? Meanwhile, a group of shepherds were going through the motions in a dark field (8). They freaked out when the angel of the Lord appeared to them (9). Still, the Good News was proclaimed (10-12). The angels praised God with contagious joy (13-14), piercing the darkness with the hope of salvation, the promise of eternal life, an assurance of peace on earth and power made perfect in our weakness. The shepherds didn’t just hear the truth, they received the Truth, and responded to Him with urgency (15). They sacrificed their agendas to see Jesus (16). They weren’t worried about the list of things that still needed to be done. They didn’t make excuses about why they couldn’t stop to spend time in the presence of the Lord. Transformed by their personal encounter with Jesus, the shepherds shared the Good News with excitement (17). 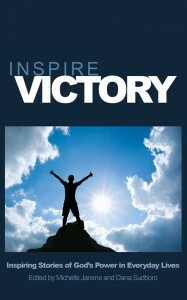 God used their testimony to reach the people within their sphere of influence (18). Meanwhile, Mary quietly “pondered” (19). Her trust began with the seed of hope planted by God, rooted in her willingness to surrender, nurtured by her obedience, watered by unconditional love, and grown by the power of the Holy Spirit. The final verse in this story demonstrates the lifelong impact of a personal encounter with Jesus. Scripture doesn’t say the shepherds glorified and praised God for a few days, a couple of weeks, a month or two, or even for years. The Bible says they returned “glorifying and praising God for all the things they had heard and seen, which were just as they had been told” (20). Their grateful praise was ongoing. Our family celebrates Jesus every day of the year, but we’ve always enjoyed our Christmas traditions. This year, with a heart aching to see my mom smile or hear her laugh just one more time, it’s not always easy to embrace merriment. As God carries me through my grieving process, I pray He’ll empower me to be obedient like Joseph and surrendered to His will like Mary. I pray I’ll always make room for Jesus and rejoice in the Good News, no matter how bleak my circumstances appear. I pray I’ll never be content with going through the motions as I wander around in the darkness of this world. 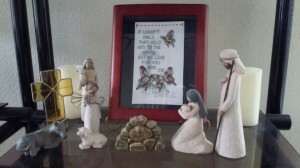 When Christmas feels anything but merry, I will gaze at my Nativity set, which sits on our shelf year round, and remember Emmanuel, God with us. My mom’s spending this Christmas in the arms of Jesus. But, so am I. Only I’ll be praising Him from this side of eternity, until the day He calls me home. How did God help you face a Christmas that felt anything but merry? What would you like to say to someone who is struggling with grief this Christmas? 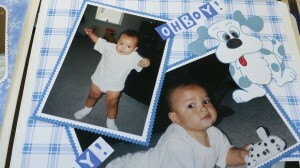 My son wobbled through his first steps. Knees shaking as he stood, he teetered back and forth before plopping onto his bottom. Day after day, he ventured a little further away from the couch. One step. Two steps. Plop! Fall after fall, he pulled himself up. When he seemed too discouraged or weary to try again, we picked him up and helped him regain his balance, or assured him it was okay to rest. With Daddy coaxing him forward, Xavier eventually shrugged off baby steps for a full toddler run. His chunky fist released my crunched finger only after his chubby arm secured a spot around his father’s neck. The grieving process is like a toddler taking those shaky, training steps. Except our Heavenly Father isn’t waiting for us to be strong enough to walk on our own. He isn’t coaxing us to venture out grasping the air in blind faith. God is with us, affirming His unchanging character, holding us up when our knees are shaking, picking us up when we fall. Yes, He’s carrying us when it feels impossible to take one more step. 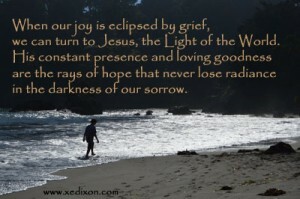 When our joy is eclipsed by grief, we can turn to Jesus, the Light of the World. His constant presence and loving goodness are the rays of hope that never lose radiance in the darkness of our sorrow. Still, there are moments when we’re so overwhelmed with grief that we don’t have the strength to turn the slightest bit to the left or right. I’ve linked arms with those moments numerous times since October 22nd, the day my mom shook off her pain and joined the angels around God’s throne to praise Him in eternity. Those are the moments my knees buckle, the moments I plop onto my bottom, too weak to even turn my eyes away from the shadows of mourning. Thankfully, the Lord exudes immeasurable mercy and limitless power, which are magnified in my weakness. When grief thrusts us into a whirlpool of despair, fear, confusion, and anger, the first baby-step in the healing process doesn’t require us to take a step at all. If all we can offer is a broken sob in prayer, we can depend on Jesus to turn toward us in compassion and mercy. What do you think is the hardest thing about the grieving process? How did God comfort and strengthen you as you grieved over the loss of your loved one?